I'm new-bie to RNA-Seq and I'm trying to set up RNA-Seq analysis pipeline. Now, I've got stuck on calculating FPKM from HTSeq counts table. I've read some articles about FPKM like this and questions on Biostars. But, I' not sure that did I correctly understand because can not reproduce FPKM with public data. Gene lengths are extracted with scripts from this article. The result is totally different from what I expected. What's wrong with my calculation or what's wrong in my understanding? 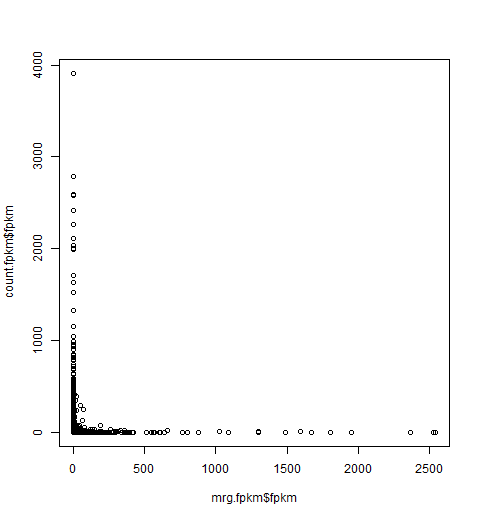 So basically the read count per gene, divided by its length and the total read count. This results in a tiny number. Hence, one multiplies with 1mio to make the number more intuitive to use. Still, FPKM is no longer considered a good choice for RNA-seq. Rather than that TPM seems to be more reasonable (google for Lior Pachters blog together with "TPM" for some details on that). Some suggestions: First, use a published package for RNA-seq analysis, such as edgeR, DESeq, kallisto-sleuth, etc. These tools will do the calculation for you, including proper statistics and FDR corrections. 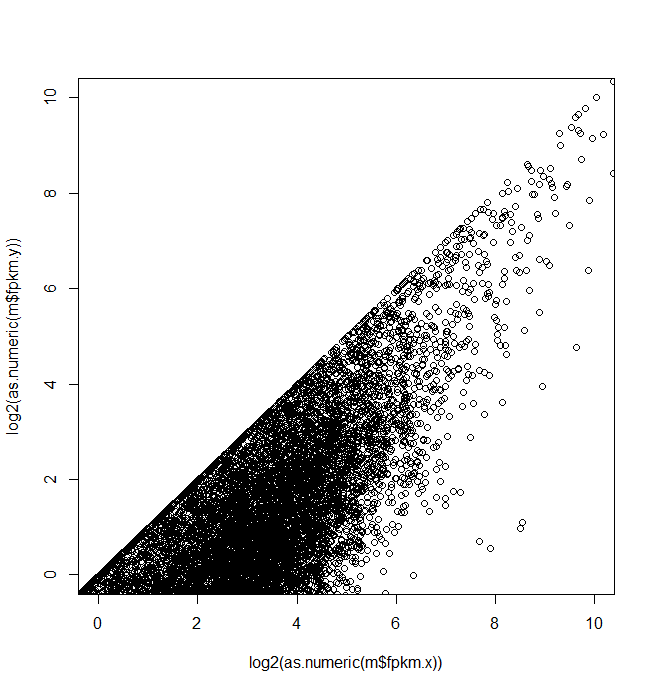 Second, when plotting data of this kind, use log2-transformed values to avoid excessive axis limits, e.g. log2(readcount+1), +1 as log2 of 0 is undefined. Thanks for your suggestions, and you were right. I found the relationship between fpkm value from data portal and the I calculated. So from now, based on what I understood, I'm going to learn about TPM and other pre-built packages, as you suggested. Thanks. The Total Count and RPKM [FPKM] normalization methods, both of which are still widely in use, are ineffective and should be definitively abandoned in the context of differential analysis. The first thing one should remember is that without between sample normalization (a topic for a later post), NONE of these units are comparable across experiments. This is a result of RNA-Seq being a relative measurement, not an absolute one.